Kitchen tile design projects can be daunting. So many choices. Almost any material from glass to stainless steel to travertine tile can be employed in virtually limitless patterns for your kitchen backsplash, floor or bathroom tile design. Options are excellent, but sometimes that’s the trouble..... Where do you start? First thing to do is..... review the tips and styles on our kitchen backsplash ideas page and determine the general theme you’d like to create. Once you’ve narrowed down the look or theme you want start to consider the materials you’ll use to express that theme: tumbled marble tile, travertine tile, glass tile, slate tiles, granite or other stone, ceramic or porcelain and don't forget accent pieces that can be almost any object or material. Don't rule out metal backsplash tiles either. 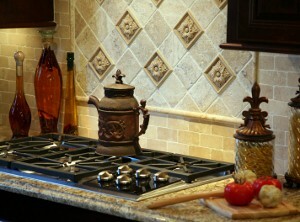 They come in all sizes and create compelling kitchen designs as a full backsplash or as accents. A copper backsplash, tin backsplash, stainless steel backsplash, tiles or pieces blend nicely with many other materials, styles, themes and color palettes. But play around with your own ideas, because truly the number of possible patterns is infinite. You may also consider using pre-made tile sheets for easier installation. It's a great creative challenge and very rewarding too. Chances are whatever design you create will be completely original and unique. So have fun with it! Certainly visit as many showrooms as possible to get some solid kitchen remodeling ideas and a feel for the materials and textures used in various kitchen backsplash and tile designs. You may find a patterns and materials that are perfect for you, but realize that ideas and materials can come from anywhere. One good piece of advice is to keep your tile design simple. Use colors and elements that complement and blend well with each other, your kitchen cabinets and countertops. Think balance and harmony. And if you want someone else to create your kitchen tile design then search locally or on the internet and you’ll find many people who can take your backsplash idea and create a pattern for you.